Are you a romantic? Do you love pirate tales and swashbuckling movies? How about Oceanographic Research? 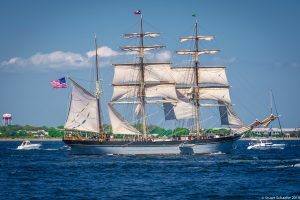 Sail away at Tall Ship Festivals, Races, Regattas, Challenges and Celebrations! Stu and I spent three days exploring Tall Ships in Pensacola, Florida at the Tall Ships Festival. 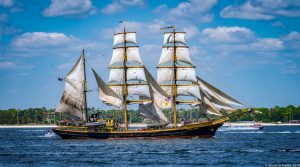 There are Tall Ship events in North America each year as well as races and celebrations around the globe. One source for finding a Tall Ship Event near you is the Tall Ships Network. C’mon senior travelers! The Tall Ships Challenge is an annual event organized by Tall Ships America. It alternates in a 3-year cycle among the Great Lakes, the Pacific Ocean and the Atlantic coasts of North America. The Challenge is a series of races and rallies. The Tall Ships Challenge began in 2001 when vessels from six countries visited dozens of North American cities. The Barque Picton Castle is a three-masted tall ship based in Luxembourg, Nova Scotia and Canada. This vessel, along with 4 others, made their way along the Pensacola Bay. We were in awe of the ships we explored! The Festival began for us by driving to Pensacola Bay to watch the “Parade of Sails.” We will NEVER forget that sight! It was breathtaking to watch the Tall Ships sail into view. As they approached, the ships were surrounded by small vessels filled with local spectators. Tugboats greeted the Tall Ships with celebratory streams of shooting water! It was one of the most magnificent sights we have ever seen. The excitement continued. We were able to tour each of the Tall Ships over the next three days and boarded 100-year old vessels doing Marine Research as well as those that give amateur sailors an opportunity to sail and navigate the ships at sea. The crews were generous with stories, history and enthusiasm for the Tall Ships! On shore, vendors catering to sailors served food and sold marine supplies and equipment while music wafted over the harbor. The Tall Ships Festival was, for us, one experience we will never forget. We hope you will find the Tall Ships nearby one day too!